Samsung Galaxy S3 review: This quadcore processor-powered smartphone is big on screen and innovative features, but is it enough to beat Apple's iPhone 4S into submission? The Samsung Galaxy S3 follows on from the runaway success that was the Samsung Galaxy S2, which won great praise and sold in huge numbers, helping Samsung snag the crown of the biggest mobile phone manufacturer in the world, and has since been joined by the pared down Samsung Galaxy S3 Mini. So the new Galaxy had a lot to live up to. It had to be fast, powerful and feature-packed. Oh, and it had to look classy. So, how does it fare? The S3 has gone big on innovation, with lots of new features the speculation hadn't dreamed of. But the first thing you notice is the size. Samsung has shown it can make a success of big screens with the 5.3in display on the Samsung Galaxy Note. But that's not a phone, it's a new breed of device somewhere between a phone and a tablet. Rivals like HTC had been stretching our mitts with 4.7in display blowers such as the HTC One X. The S3 has a 4.8in display and it's certainly big. It's a slim phone from front to back so it's more manageable than you might think, but even so. Actually, what helps more in terms of comfort is the gloss finish. It's like a smooth, flat worry stone that you can roll seamlessly through your fingers. A matte finish wouldn't have felt as good. Though some will feel that the glossy coat looks a bit, well, plasticky. But it feels appealingly shiny and reassuringly solid despite a removable battery. Where rivals like the Nokia Lumia 900 and HTC One X have maximised battery life by sealing it inside, and thus created a flex-free handset, the S3 is pleasingly non-creaky, no matter how you hold it. Sometimes a new phone is only a gentle upgrade over the last model, but the S3 is streets ahead of the S2. It's not quite as slim, though at 8.6mm it's just a tenth of a millimetre fatter and it lacks the earlier phone's bulge. Back to the size. If your hands can, er, handle it, the positive consequence is a superbly viewable screen. Video playback on a mobile is always a questionable priority – if you can't watch on a TV, a tablet makes much more sense – but with 4.8ins of high-resolution Super AMOLED screen with its vivid colours and contrasty blacks, this makes it more of a possibility than before. The screen resolution is identical to the HTC One X, so the pixels per inch aren't quite as high on this slightly bigger screen, but both displays look lush and inviting, with this one winning in terms of bright, rich colours. The Galaxy S III uses the very latest version of Android, 4.0.3, codenamed Ice Cream Sandwich. This is far and away the best version of Google's operating system, with a cleaner look than before. Ice Cream Sandwich lets you put these buttons as virtual icons onscreen, like on the Galaxy Nexus. Here there's a physical home button, an elongated strip in the centre of the phone's face at the bottom. Either side are two virtual capacitive buttons. Samsung has rejected the Recent Apps button in favour of Back and Menu options. Much better. And if you need it, a long press on the home button brings up the Recent Apps screen. The latest OS doesn't just offer yet another tempting-sounding treat to get our mouths watering. It's a whole new interface which is redesigned throughout in contrast to previous iterations which have felt like layer after layer glued on top of the previous code. It includes nifty features like face unlock which matches you to a previously taken photo to launch the phone from idle. ICS brought Recent Apps front and centre – though the S3 has de-emphasised it again. Samsung adds its own refinements, like the capability to take a screen shot by wiping your hand across the screen. It's the new features on the Galaxy S3 which really stand out. There's S Voice, which is a voice recognition service after Siri's heart, designed by Vlingo (a company which is now being bought by Nuance, who contributed to Apple products and, presumably, Siri). Although it's competent, it lacks Siri's wit and whimsy, so you're best sticking to straightforward commands. Like Siri, it's not invariably accurate and it is server-driven so won't work at all without a decent data connection. Even so, it's good fun and there's something slightly magical about it. And Smart Stay, which uses the front-facing camera to periodically check if it can recognise a pair of eyes looking at it and if not, it turns the screen off to save power. There's also Smart Call, which dials a contact's number for you by raising the phone to your ear from the contact details screen. True, these seem like nothing more than gimmicks, but they are quite cool ones. Perhaps the most gimmicky of all, Social Tag uses facial recognition to match faces in photographs with the profile photos in your contacts. Now, assuming the profile photo isn't of a dog or a witty poster, the phone shows that contact's latest status update and makes it easy to call or message them. We can't see it catching on. Samsung has tried to create the phone that has everything and it's not far short of the mark. So there's NFC, the contactless technology that has yet to find widespread use, though it's good for Android Beam to transfer contacts between compatible Android handsets. Samsung takes this one big step further with the inclusion of S Beam which adds WiFi Direct to the wireless transfer connection so you can beam video files quickly between S3s. You can throw content from the phone to a suitably equipped TV if you find the 4.8in display doesn't do your movies justice while a feature called Smart Alert makes sure you know about missed calls or messages by gently vibrating or whistling a merry tune. With so many apps to choose from, how do you know what's good and what's not? Samsung's Game Hub has a (small) selection of recommended titles. Some are free, and then there are premium apps to pay for. Helpfully some games can be tried before you cough up money. The Music Hub is now up to version 3.0 (HD) and promises to be “the complete music solution for your Samsung device”. It costs £9.99 a month and promises unlimited streaming. You can also upload tracks from your personal music collection so you can listen to them everywhere. It has a neat interface and a huge catalogue – 17 million tracks. The Video Hub is is where to go for movies – though there's also Google Play, of course, which is arguably more attractively laid out. Like the Game Hub, there are helpful recommendations from best-selling to staff picks. Last year, the Galaxy S2's 8MP camera was above average. Now the competition has caught up and the S3 was rumoured to be getting a 12 megapixel camera, but instead it's got the same snapper as the S2. Still, it's a decent sensor which delivers strong results and you can also capture full HD 1080p video. The front camera sports a 1.9MP sensor and can capture 720p video at the same time as taking a still picture. So you won't be short of features to play with. Which drains the battery, of course. The other advantage of a phone this big is it can cram in a large battery. 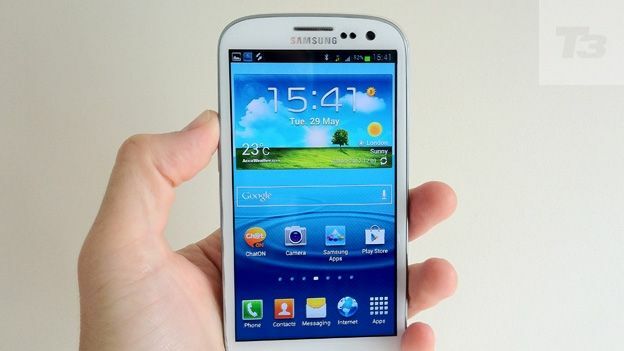 Video: Samsung Galaxy S3: How big is it? The one in the S3 goes on and on – unlike some Android phones in the past which conk out after lunch. And since it's a removable battery, you can carry a spare as well (although, we've yet to find anybody that actually does this). Speed is important, especially when you want to do more with your phone, like play high-definition video smoothly. So the on-board quad-core processor really helps. It's not quite as fast as the one in the HTC One X, but it's a real powerhouse that never slows down however much demand you're placing on it. A second microphone means call quality is good and signal strength was solid and strong. This is the most feature-packed Android phone yet, and one of the most powerful. If you're an iPhone user who's feeling their handset's a bit puny in comparison, this is the best time to make the switch from iOS to Google – though it's still nowhere near as intuitive to use. The next generation of wireless data - 4G - has arrived courtesy of EE (Formerly Everything Everywhere) and having seen the OM4G posters and Hollywood A-Lister Kevin Bacon EE advert, we checked out what superfast mobile internet is currently made of with the 4G EE Samsung Galaxy S3. Rolling out to 16 cities before Christmas, we spent our time testing the Samsung Galaxy S3 LTE in Central London and West London and found 4G coverage dropped in and out depending on location and whether we were indoors or outdoors. The benefits of EE 4G should be increased data speed (up to five times faster than 3G networks to be precise) for downloading and uploading while streaming and gaming should be less interrupted by buffering and lag. Using the Speed Test Android app on our 4G and 3G handsets there was a significant difference in terms of download speeds and upload speeds.The S3 averaged 25000kbps (25Mbps) compared to around 500kbps (0.5Mbps) download speed for the 3G device. In terms of upload speeds, it was comprehensive once again with the S3 averaging 25000kbps (25Mbps) to just 25kbps (0.25Mbps) for upload speed. Part of the EE 4G package is that you can download and stream one free film a week to watch from its dedicated Movie app. Attempting to download the 700MB plus file was a breeze over 4G until the connection dropped out as was the case in many situations we tested it. Streaming the movie was equally impressive with no signs of buffering until we were returned back to 3G+. The same can be similarly said about gaming and watching videos on YouTube, it's great until that 4G connection is lost. In just a few days of usage we managed to rack up over 1GB of data which for some people with data packages would be the end of the line. With the free EE movies not counted towards your allowance, we still found it possible to chew up a significant amount of data but that was probably more down to intensive testing purposes. We found tha the 4G performance was miles ahead of 3G in many ways, as we'd expected, but with coverage still patchy, you really have to be desperate to download big files and be a serial video/picture uploader to Facebook to want to pay some pretty big tariffs to get in on the action now. If you're happy to do more data consuming tasks when you are on the Wi-Fi at home or work, it might be worth holding on for 4G to spread a bit further and prices to drop a little more to justify making the leap. For Android lovers, it's hard to fault the Samsung Galaxy S3 and the only other handset to come close is the HTC One X – and it comes very close. 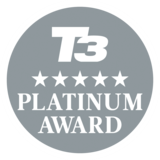 The S III wins out for features and innovations. But, be warned, it's going to be too big for some hands. The S3 is a mighty big phone that's powerful, feature-packed and exceptionally desirable.